Allah is very Powerful. One of this Powers is that if He wants something, all he has to say is “Be,” and it happens. To discuss this, we pulled out our PlayDoh. My daughter’s current favorite nasheed is “Allah Made Everything” by Zain Bhikha. Towards the end of the nasheed, it says… “Allah made everything, Allah made everything, Allah made everything, the Earth and the blue sky.” For this reason, I decided to focus today’s conversation on this Earth. Additionally, my daughter is constantly curious about where various relatives live, and we’ve marked on a map where different cities are. I felt like she would really appreciate seeing the Earth, so that we could fly a toy airplane from city to city, and pretend we were visiting our family. 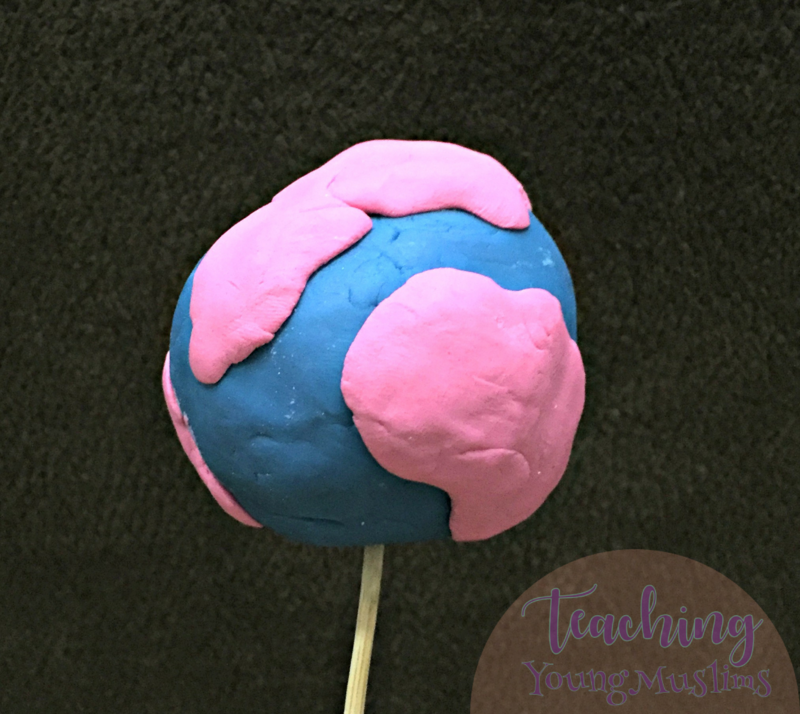 To make our Earth, we decided to use PlayDoh. We started with blue, and made as big a ball as we could. For the continents, we used pink. We just made shapes that vaaaaguely resembled continents and smoothed them on the surface of the blue ball. After we finished, we discussed how we built our Earth. We had to go step by step and work hard to make our Earth the way we wanted it. We had to squeeze and roll and pinch and flatten and squeeze some more before we were finished. We talked about how long it took to build our Earth. Then we talked about the real Earth. We discussed that it was thousands of times bigger than our Earth. We discussed that it had mountains and rivers and deserts, things that we did not even include on our “model.” We thought about all the plants and animals and people that live on the real earth. Allah (SWT) built the Earth, but He did not have to squeeze and roll and pinch and flatten it. All He had to do was say “Be,” and it was. That is one of His Powers. Are you feeling inspired? Let me know!